Just because summer is over, doesn’t mean that the fun has to stop. We have our list of September FunZones ready for you around Ontario and the Niagara Region. Make sure to like us on Facebook and follow on Twitter for additions, times and updates on these great events. Downtown Sudbury comes alive with live entertainment, food, merchandise, car show, inflatable bouncy castles for kids, ribs and more! Best of all admission is free. 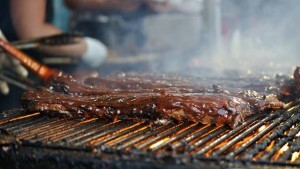 Downtown Sudbury Ribfest on Facebook. For the first time ever, Niagara Inflatables will be hosting children’s entertainment for the Merritton Lions Community Day on Labour Day following the Merritton Labour Day Parade. The Parade moves out at 11:00 AM and ends on Seymour Street. Want to ride The Fun Express Train and get Free FunZone Passes? Listen to 2DayFM 101.1 and 105.1 FM for your chance to win. The Niagara Food Festival offers fantastic food from local restaurants and food producers, celebrity chefs on the Mobile Culinary Theatre, live entertainment for all ages and much, much more. The Stamford Centre Volunteer Fireman’s Association runs their annual Harvest Festival to raise fund for different charitable organizations. Held in their beautiful Fireman’s Park in Niagara Falls. One of Niagara’s Largest Annual events held annually across Niagara, the Niagara Inflatables FunZone will be available at Montebello Park, St. Catharines in the heart of the action. You can also find us in the parade. Kids up to the age of 12, mail us a drawing of you and your favorite bouncy castle along with a short letter why for a chance to ride with us on our Train in the parade. BE IN THE GRAPE & WINE PARADE.